Welcome to PEMBI “Midrand-Centurion”. Our beautiful venue is situated on the same property as The Thatch Wedding Venue. 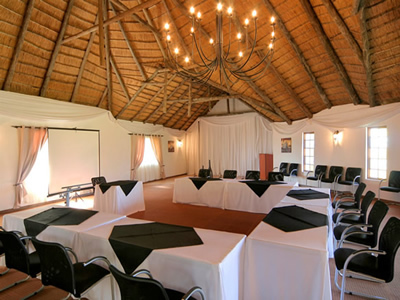 You might be forgiven for thinking that you are miles away from the hustle and bustle of city life with our “country feel’ conference and accommodation facilities, when in reality you find yourself literally on the border of two growing business hubs, namely Centurion and Centurion. Easy access from Centurion, Centurion, Sandton, Randburg, Midrand, Johannesburg, Pretoria, and OR Tambo International Airport, together with the flexibility of our facilities make them equally suitable for day conferences, meetings, product launches, breakfast presentations, company breakaways, strategizing meetings, team-building and workshops alike. Follow the R28/N14 Krugersdorp until you get the Sandton Hartebeespoort dam off ram. Take off ramp. Do not turn left or right but carry on straight over the double road, which is the R562 Midrand. +- 500m down the road you will find a green board that says The Thatch Guest House turn right into dirt road up to black gate and press intercom. Take N1 Pretoria until you get Olifantsfontein off ramp you will see Protea Hotel on your left. Take Olifantsfontein off ramp turn left at off ramp carry on straight for approximately 11.5km you will see The Thatch Guest House board and turn left up the little dirt road. Take Pretoria highway until you get to William Nicole. Take off ramp and turn left you will pass Midrand Mall on your left. Indaba Hotel on your left, Dainfern on your left. Carry on straight until you see MNANDI board on your left and a BIG The Thatch Guest House board on your right. At that board you turn right, carry on straight to the stop street. At stop street turn left 1.5km down the road you will see The Thatch Guest House board turn left up little dirt road.